Fundamentally speaking, as long as a campsite is safe and clean, all’s well. 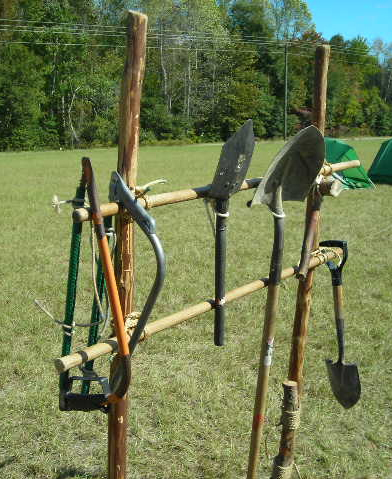 However, especially for longer term camps (or when displaying demonstrations of Scoutcraft skills), there’s definitely something to say for the added convenience of a campsite tool rack. Set up in a prominent location (in or near an axe yard), a tool rack serves as a reminder to put tools back where they belong. A place for everything, and everything in its place, especially wood tools, goes a long way in not just keeping things well-organized, but also towards limiting accidents. Construction is very simple. Basically, all that’s needed are four poles; two 6-foot uprights, and two 5-foot cross pieces work fine. The cross pieces are connected to the uprights with four square lashings. Tools are hung on the rack, suspended by a looped cord attached to the top cross piece with a lark’s head. 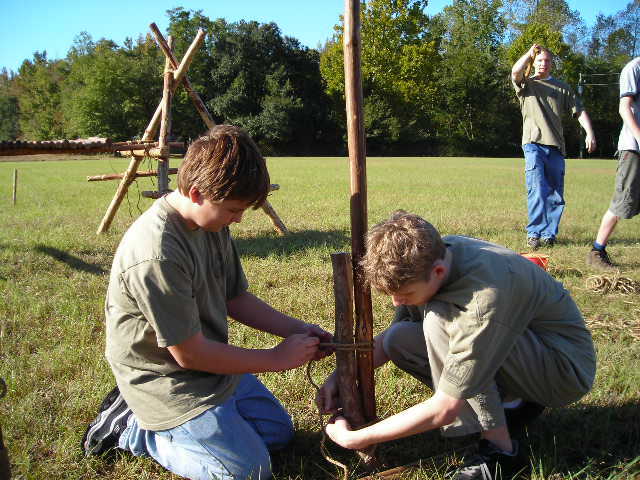 Scouts attach a 6-foot stave to a pioneering stake with two round lashings. If the two upright’s cannot be sunk or hammered into the ground, pound in a couple of pioneering stakes and hold the uprights in a vertical position by lashing them firmly to the stakes with a couple of tight round lashings. Click here for Tool Rack 2. Check out a tool rack rain cover at the bottom of the post.